Social Security Disability (SSD) benefits are part of a government program to provide compensation for living expenses (and in some cases, medical coverage) for people unable to fully support themselves due to disability. The laws surrounding Social Security Disability benefits are complex and often confusing for both laypeople and inexperienced attorneys alike. 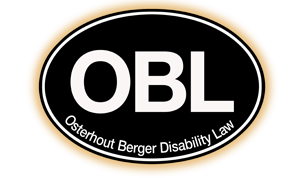 From our offices in Pittsburgh, the lawyers at Osterhout Berger Disability Law, have helped more than 20,000 disabled individuals throughout Pennsylvania, West Virginia, Ohio, and Maryland with filing or appealing a Social Security Disability claim. For a free consultation with a Pittsburgh SSD benefits lawyer, do not hesitate to contact us. Accepting the term “disabled” can be difficult for individuals dealing with a mental or physical limitation. It can be hard for individuals to admit that they are unable to adequately provide for themselves or for their family. There may also be conditions that actually prevent an individual from performing basic daily functions that are not recognized as disabilities by the Social Security Administration. Some others, however, have apparent and obvious mental or physical impairments that seriously limit their ability to live an independent life. Social Security Disability benefits may be the answer to giving these people the ability to be self-sufficient and live their lives with dignity. There are two types of Social Security Disability benefits — SSD and SSI. SSD, otherwise known as Social Security Disability, is based on the amount of taxes a person paid while he or she was able to work. SSI, or Supplemental Security Income, is generally available for those who do not quality for SSD. A common reason for disqualification from SSD and the selection of SSI as a benefit option is a limited work history or no previous work experience at all. Can I Work and Still Be Eligible for Social Security Disability Benefits? It is possible to work part time or occasionally and still receive Social Security Disability benefits. You may also be able to receive other benefits, such as long-term disability insurance and veterans benefits. These options are offered on a case-by-case basis. When Should I File for SSD Benefits? One question we are often asked is: “When should I apply for benefits?” The answer is simple: Apply for Social Security Disability as soon as you believe you can no longer work, or think that you may be unable to work for a continuous 12-month period. The process of awarding benefits can be a lengthy one, so the sooner you apply the sooner you will have a decision. To schedule a free confidential consultation, please call us at 412-794-8003 (locally in the Pittsburgh area) or toll free at 1-866-438-8773 (outside the Pittsburgh calling area). If you prefer, you can fill out our intake form, and we will contact you to schedule an appointment.